Watch this page for video, speeches and photo links for Graduation 2019. We are delighted to share the list of colleges who have accepted at least one member of this year's senior class. We are so very proud of all these students and their individual and shared accomplishments over the past four (or more!) years on our campus. No matter where they choose to set down their bags next fall, we know they will carry on the long tradition of Wheeler graduates by sharing their strong sense of compassion and citizenship for each other and the world around them — Wheeler College Counseling Office. 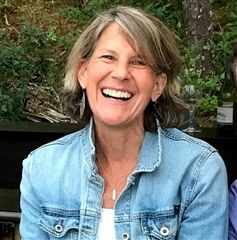 Wheeler is excited to announce that English Department faculty member Annie Funnell will be this year's Commencement Speaker for the Class of 2019 on Friday, June 14. Annie says she has spent at least part of each of the last 56 years in school. She grew up as a faculty child at a small boarding school, South Kent School, in Connecticut. After graduating from there (a year behind Wheeler colleague Doc Gilder) and from Amherst College (with her classmates Dan Miller and Neeltje Henneman), she spent a year in Boston as a copy editor, trying to escape the family profession (her grandfather, father, brother, husband, uncles, cousins, both sisters-in-law and now a nephew have all been educators). Nonetheless, by the next fall, she was working in Admissions, teaching art and coaching crew and cross country at South Kent. Four years later, after spending seven months backpacking alone through Tahiti, The Cook Islands, Fiji, New Zealand, and Australia, she began teaching (art, Latin, and English) at Berkshire School in Sheffield, Massachusetts, where she was also a dorm head and the crew coach. Annie met her husband, Wheeler science teacher Bob Schmidt while working at the Wolfeboro Camp School one summer, and, after they were married (25 years ago this June), she joined the Wheeler Faculty. She has been a member of the Wheeler Upper School English Department ever since, and Bob and Annie's two sons, Eli '14 and Zander '16, both "survived" the fifteen years from Nursery to 12th grade. Having grown up in a boarding school, Annie is especially fond of spending afternoons watching games at the farm, and, sadly, would always prefer cheering on Wheeler teams to grading papers. She is currently the Class Dean for the sophomore class, but she has always been a Big Fan of the Class of 2019.